Time is the first key ingredient to your long-term social media success. Social Media Examiner’s study asked respondents to indicate how many hours per week they dedicated to social media, and whether or not they saw improved sales from these efforts. The results show that those who consistently put in the time, week after week, saw the best results. Of the marketers who spent 30 or more hours per week on social media, 65% reported increased sales directly linked to those efforts. So how can you achieve these gains using social media? What are your social media marketing goals? Are you trying to drive a record amount of traffic to your website? Or maybe you need to generate a certain number of qualified leads by the end of the month. There are a couple of simple ways you can calculate goals. If you have historical data on your social media metrics, you can develop a schedule of goals based on a target growth rate. So if I generated 1,000 social media leads last month and I want to achieve 20% growth month over month, my goals in the upcoming months will be 1,200, 1,440, 1,728, and so on. Alternately, you can base your social media targets on your overall marketing goal. In other words, you can work backwards from the overall number — let’s say it’s a leads goal — by determining what share of your total goal will be supported by your social media efforts. For example, if you want to generate 10,000 total leads this month, you could commit your social media channel to a contribution of 8% (800) of those leads. By setting specific quantitative goals up front, you will be able to prioritize your efforts and determine where your time is best spent. Your goals will also drive the type of content that you create and the calls-to-action you use. So if you’re trying to generate new leads who are interested in, say, unicorn footwear, you know you should spend your time building an information-rich offer on unicorn footwear that you’ll promote on your social media accounts via a dedicated landing page. 2) Determine which social networks will let you to reach your goals. You’ve got the obvious options — LinkedIn, Facebook, Twitter – along with a host of niche networks, from Epernicus (a professional networking site for research scientists) toRavlery (a network for those who love knitting and crochet). You’ll find that certain networks will be more effective for your business than others. The most recent State of Inbound Marketing Report found that different industries experience different customer acquisition results with Facebook, LinkedIn, Twitter, etc. For example,businesses in the Retail space reported tremendous success with Facebook (92%), whereas Healthcare businesses did not. Instead, Healthcare’s highest success rate was with LinkedIn. You can figure out which networks are right for you with a little bit of market research and experimentation; we also have a blog post on the subject to guide you through the social network decision making process. Once you have some data points, you can create more granular goals by channel. The more you experiment with different social networks, the easier it will be to make informed decisions about which networks should be contributing the most to your goals. 3) Create a content plan. Now that you have goals set and a sense of which social networks to leverage, you can build out a content plan. Because what else will you feel your social presence with? If you’re trying to drive traffic and leads, you need a ton of content to actually meet those goals. To start, you will want to build a list of your current inventory of offers so you can see what you already have to work with. This will also make it easier to rotate old offers back into the mix at a later date — remember, content you post to your social media accounts expires quickly, so it’s okay to resurface offer content. Next, your team should keep a document outlining the content in the pipeline to be created, and each offer’s expected date of completion. Keeping a schedule like this not only helps keep everyone informed — it also helps keep people on track to meet their content creation goals if they know your social media success depends on it! There are a wide range of offer types to consider adding to your pipeline, from videos, to infographics, to information rich ebooks. Some of these formats will be better at generating general traffic, while others will appeal to a more targeted audience that can convert into qualified leads. That’s why it’s important to go back to your goals. Ask yourself: Are the offers we’re planning to create and promote aligned with our social media goals? Once you know what content you have at your disposal, it’s time to create a publishing calendar. This should be a schedule that you will adhere to on a daily basis. It doesn’t have to be complicated — it can live in a simple Google Doc or shared spreadsheet that multiple team members can access. Also, don’t feel that you need to build everything out a whole month in advance! Usually a week or so is all you need. The calendar should contain everything you need so that you can execute the updates quickly. For example, for Twitter you should have the tweets pre-composed so you can just copy & paste, or schedule them using a social media publishing tool. There are lots of different update types to choose from, so get creative. And for some excellent tips on how to compose highly optimized updates, I recommend you check out this recently published guide on the subject. 5) Set aside time in advance. 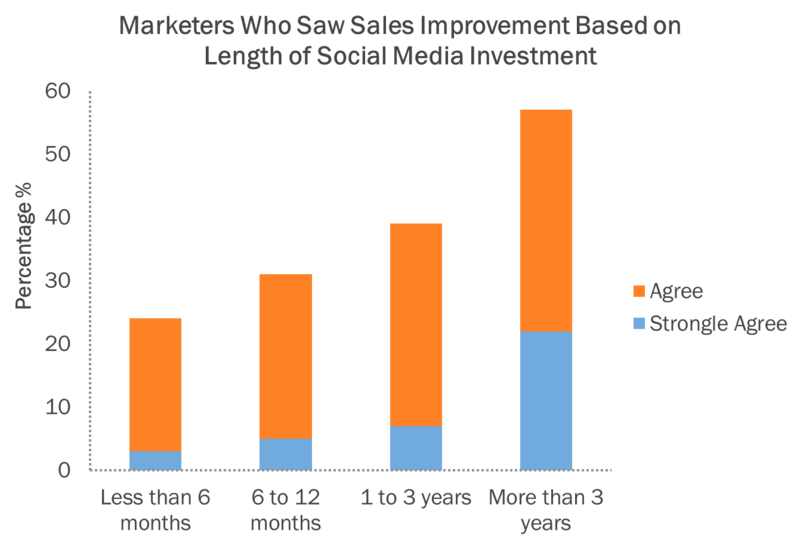 Social Media Examiner data also shows that consistency is key. Make sure you block off a bit of time in your calendar every day to monitor how your fans and followers are engaging with your content, keep the conversation going, deal with any problems that arise, and assess (even if just anecdotally) what type of content is resonating with your community. You should also proactively find people to connect with — look for influencers in your industry you can follow or retweet on Twitter, for example. This doesn’t need to take up too much of your day, but a periodic check-in will help you build your reach faster, and maintain a good reputation with your fans and followers. Think of it as an investment. You won’t experience social media success overnight; but with time, your social media presence can become a valuable asset to help you achieve your goals!